24 7 News Net - DC Sniper Forming PENTAGRAM! Sniper Strikes 2nd Time Where Psychic warned! FALLS CHURCH connects the shootings! Sniper Strikes 2nd Time Where Psychic Warned! Falls Church Fits Pattern on Map! We have another sniper shooting. The police still don't know if it's the sniper. I know it is. The reason is the sniper struck exactly where the world famous Sollog warned me last week. This is the SECOND TIME the sniper has struck where Sollog warned. FALLS CHURCH fits the pattern of the name location he described. Sollog has said from day one these shootings are a religiously motivated sacrifice. FALLS CHURCH = FALL OF THE CHURCH. The most amazing part of the Sollog sniper warning was not how CHURCH or RELIGION just popped up in the name of a location. It is the fact that FALLS CHURCH is the connecting point between all of the shootings. As Sollog warned me, which my earlier sniper articles explain in detail (see links below), the sniper is forming X's or CROSSES on a map. When the shooting locations are all connected as Sollog explained FALLS CHURCH is the intersecting line between all of the shooting locations. 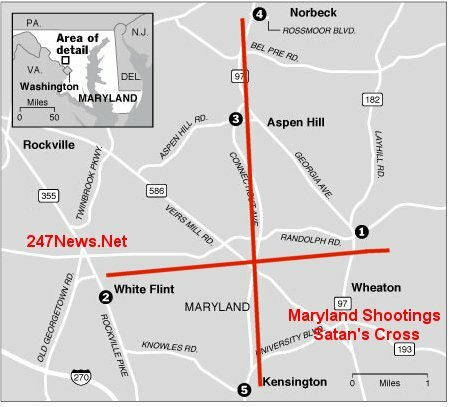 Look at the map below, the first group of shootings were in the Rockville Maryland area, connect that location to the last shooting near Fredericksburg Virginia. Falls Church is on that line. Now connect Manassas Virginia to Bowie Maryland. 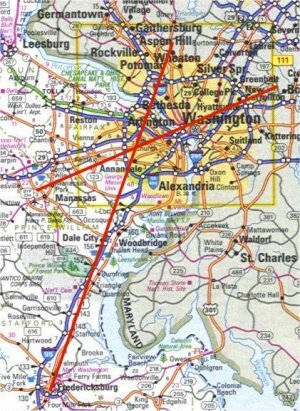 That line intersects the Rockville to Fredericksburg line right in FALLS CHURCH. These two SNIPER LINES just happen to connect where the 11th shooting took place in Falls Church Virginia. This is the 9th murder. 9 murders and 11 shootings. LOOK 911 just appeared. Anyway, the two sniper lines forms an X or a CROSS on a map as this image shows. The exact image Sollog warned the sniper was trying to create. Now I've written a couple of books about Sollog so that is why I'm the only person in the media he talks to. Tonight he warned me that a Pentagram is also forming over the DC and Maryland/Virginia area by these shootings. He said, "The sniper may now strike in either the St. Charles area or St. Mary's area to complete an upside down Pentagram or a satanic symbol." See map below. 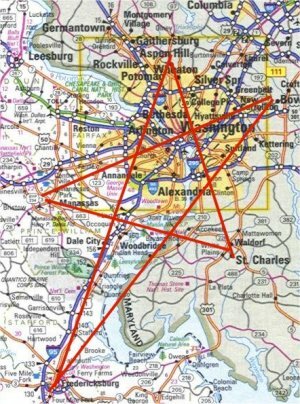 He also warned, "Areas where the lines intersect on this Pentagram such as Falls Church and Alexandria should be key sacrificial areas to a Satanist as well. The killer still has to redo their Bowie sacrifice since the victim lived. This Pentagram now looks more like the key figure the sniper is trying to create. The first 5 kills formed a satanic cross above DC. Now the rest of the kills are starting to align into a huge upside down pentagram. The areas I originally saw as being connected to future locations of interest to the sniper since they formed large satanic crosses are now not as important since the Pentagram has been found on the map. That is the key symbol of power the sniper is creating in a black magic ritual."